Saving big on games in the Nintendo eShop until November 28. Today, Nintendo rolled out deals on games available in their eShop. The sale starts now and will run until November 28 at 9 a.m. (PST) or 12 p.m. (EST). Many of the discounts available through Nintendo’s eShop Cyber Deals sale offer 50% off on popular games including DOOM and The Elder Scrolls V: Skyrim. Wondering if the game or games you have on your wishlist are on sale? Below, you’ll find a sample list of discounted games that can be purchased as part of the Nintendo eShop Cyber Deals sale! 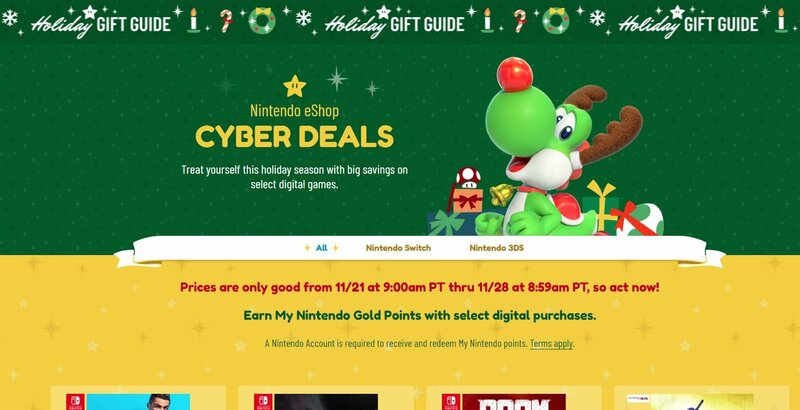 To review all of Nintendo’s eShop Cyber Deals, be sure to check out the official deals page for Nintendo Switch games, and the official page for Nintendo 3DS games.